When I first started out in online business (coming on 7 years now) I was one of the most annoying people you could have met on your travels. If you knew your business facts, I'd ask you about everything you can possibly think of, from list maintenance, making sales, traffic, joint venturing, you name it, I would have asked you. It's this single factor that I attribute to the success I've seen online. There was always one question though that I was particularly interested in. It was a simple one, although not quite as simple to answer as it was to ask. This question was "Hey, I saw the massive launch of your site the other day. I hear you secured a circulation of almost half a million on launch day, how did you manage it?". Apologies to those in that I asked this over and over again, every single time they launched a product, but hey who wouldn't, after all, what would a circulation of half a million on your product launches mean for your sales? Anyway..
Joint ventures they told me. So my next question was "Right, so you go out and find all those who are successful, and send them offers and deals trying to get access to their promotion material for free right?". I always got a straight answer to that one. 'Yes'. That is, always but once. There was only one guy that gave me the full story. "Oh no, definitely not. That's what everyone else is doing and what everyone else is teaching. If you could see how many annoyed list owners I speak to every day that keep getting hundreds of useless deals every week, wasting their time and really getting on their nerves, you'd probably go so red in the face with embarrassment, you'd never do that again". The conversation continued. "So if all these list owners are annoyed at the piles of useless offers, that would mean that very few are actually being noticed, or even accepted. So if I wanted to secure massive launch day circulations for products like you do, how would I go about it?" I'll tell you on one condition he said..
"You promise not to tell anyone else for 12 months. Let me get my big name contacts and my huge circulations and secure my long term deals first, then you can tell who you like if these methods still work". I agreed. My business has changed beyond recognition for the better simply because of the techniques this guy taught me in about 30 minutes. I've honed this technique, stress tested it, pushed it to it's limits and out came what I now know as the most successful, and most efficient methods of securing massive product launch circulations through joint ventures that I've ever seen. The concepts are simple, but the power this grants is immense. Now it's my turn to share it with you. 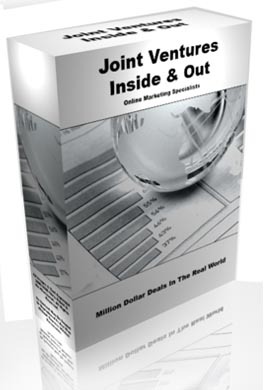 • Learn the ins and outs of joint ventures in the real world. Why is my acceptance rate is close to 90% ensuring a circulation of hundreds of thousands with my product launches, while others are struggling to secure even just one deal? It's a simple concept if you know how. I'll show you everything I've learned in the past 7 years. • Discover the little used method that will immediately tell you whether or not you're going to be accepted for a joint venture proposal even before you make first contact with your prospect. • Two of the biggest joint venture problems faced by online marketers solved once and for all, paving the way for many successful deals now and into the future. • You can secure joint ventures even if this is your first day in online marketing. I'll show you how you can secure profitable jv's even if you don't have a huge amount of money, a big name or huge promotion resources to present to your prospect. If you ever thought you didn't have anything to barter with, think again. • 5 reasons why searching for random lists and mailing them with your proposals is destroying your chances of success. This is the amateurs way, I'll show how the real pro's rake in millions of dollars every year by avoiding just 5 pitfalls. • 3 big mistakes of the JV newbie. If you've never joint ventured before, let me warn you. That one big deal that will seal a long term contact, not to mention a circulation of hundreds of thousands of potential customers for you hangs in the balance. Get it wrong the first time and it's very *very* hard to be able to re-approach your prospect. Learn the 3 big mistakes and how to avoid them before you ruin the future of your business with blind deals. • A demonstration of why bartering and counter proposals are losing you deals. If your offer is wide of the mark from the word go, despite what we'd all like to think, it's likely your prospect won't bother to counter your offer or barter with you. I'll show you why this is the case, and contrary to popular belief why this is very true. • Joint venture approaches done correctly. I'll take you through several examples that in my experience contain specific aspects that doom a deal to failure every single time someone attempts them. I'll also be showing you the opposite of this, and how much difference just a few words can make to your business. The difference between a circulation of hundreds of thousands on the launch of your product, and a circulation of zero. I know which I'd prefer. • How you can read your prospects actions to know what they want from you before you even approach them. Think about how valuable it would be if you could see thought bubbles over everyone's heads showing you what they want. Do you see how much cash you'd make simply fulfilling their needs and desires? This works along the same lines, but specifically tailored to approaching JV prospects. (Tips like this is one of the reasons I limit my products to a specific number of sales before pulling them off the shelf). • Learn 5 correct methods to use when approaching your joint venture prospects to maximize your chance of being accepted and getting your hands on what could be hundreds of thousands of potential customers. These 5 methods I see in every single correctly carried out joint venture online. Without them, deals are often doomed to failure. • You'll be making deals within 24 hours! I'm going to give you the information you need to be successful, and I'm so confident It works, I'll be setting you a small challenge to prove just how easy this is and how quickly you can become a success through this information. The results will speak for themselves. • You could be shoving far more cash in your pocket if you stop thinking about the money. It's a fact, promoting for profits isn't the quickest way to get rich, and neither is joint venturing for profits. I'll show you how to look beyond immediate profit to maximize the potential of your business, to grow rich quickly, and stay rich far into the future, where others are falling at the first hurdle. • I'll make a bet with you. I'm going to let you sail through this powerful and under utilized jv material, and then I'm going to quiz you on what you've learned. I bet you that you're less than 12 hours from knowing how to successfully make long term contacts and jv deals, and I'll prove it while you follow along so that you can be confident in your abilities before doing this for real. • 12 methods to almost ensure jv success with specific types of marketers, from the standard e-zine owner, all the way through to the powerful, targeted personal list packed full of prospects waiting to buy your products that you wouldn't even get near without jving.